We pay highly competitive prices for sterling silverware, holloware, and estate silver items. We have a multi-prong approach to buying. Whether you're selling an entire service or just individual items, our seasoned experts with over 150 years of combined experience begin by accurately identifying your item to determine the highest possible value. If the value lies strictly in the silver content - we make you the highest offer the market can bear. 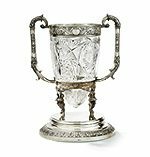 For estate and designer silver we use our industry knowledge, historical auction values and international connections with thousands of vetted silver dealers and private collectors to make you an offer you can't refuse. Our goal is to offer honesty, integrity, and reliability to each customer, that's why we offer a more complete selling process that ensures sellers receive an accurate appraisal from an experienced professional beyond what local silver dealers and pawnshops can provide. Selling sterling silver options include scheduling an appointment to sell silver at our NYC location or via our free FedEx secured and insured service with tracking at every stage. Accept our offer and get paid within 24 hours. If you decline to sell, you can trust us to return your silver with no obligation. TRUVAL's sterling silver specialists are ready to assist you in appraising and selling silverware, flatware and any piece of sterling silver including modern collections, designer silver, English silver as well as antique silver. From small items to large estate sets of sterling silverware, flatware, sterling tea and coffee sets, sterling trays, platters, candlesticks, candelabras, goblets, Japanese and Chinese silver, and much more. Sell Silver museum presentation pieces. All Chinese silver including all silver items with enamel, all pseudo hallmarked pieces, all pieces with flowers, dragons or birds. Wang Hing, Zeewo, and KHC. All Japanese silver including enamel silver, Yokahama, Arthur and Bond, Prunis, dragon designs, blossom and flower work. All Hand-hammered silver including Kalo, Alan Adler, Tiffany mixed metals,Gorham mixed metals, Whiting mixed metals, Tiffany special hand work, Jarvie and all sterling flatware set, sterling tea sets and coffee sets. A Victorian silver five-piece tea and coffee set, Garrard Co.
My recent experience with Steve and the Truval team was world class they are fair and do not play games. They are world class, Steve treated like a friend And... read moreMy recent experience with Steve and the Truval team was world class they are fair and do not play games. They are world class, Steve treated like a friend And made sure I was ready before I made a decision and I appreciat that and will continue to do business with them. I was interested in selling sterling silver flatware and some old watches. I thought I would start with Truval based on their consistently positive online reviews. It became obvious why.... read moreI was interested in selling sterling silver flatware and some old watches. I thought I would start with Truval based on their consistently positive online reviews. It became obvious why. Totally professional interaction with Steve from the initial phone call until I exited. All takes place in a real office, not the typical booth manned by impatient or rude salespeople. I never felt rushed or pressured and explanations were provided as to how values for various items were arrived at. A first class experience resulting in what I thought was a fair purchase price for my items. I've search all over for the best price on my silver and Steve at Truval was the best price by far. Thank you for your honesty. I sold several old sterling silver items to Truval. The transactions was fast and fair. Pleasant experience and highly recommended. Steve and team at Truval are the real deal. Patient, kind, knowledgeable, not at all pushy, and all around solid. I brought in a number of random jewelry pieces for... read moreSteve and team at Truval are the real deal. Patient, kind, knowledgeable, not at all pushy, and all around solid. I brought in a number of random jewelry pieces for evaluation and not even the tiniest one was unworthy of Steve's time. My appointment with them was an easy and enjoyable experience, and I left a happy customer. Highly recommend Truval.